Important pair of wheel-lock pistols by Giovan Antonio Gavacciolo, the pre-eminentBrescian lock maker and iron chiseler of his time. Locks each struck on the inside with the maker's mark, (Neue Stockel 427), with finely engraved and chiseled interior detail. Figured walnut stocks inlaid with the finest and most delicate iron tracery. 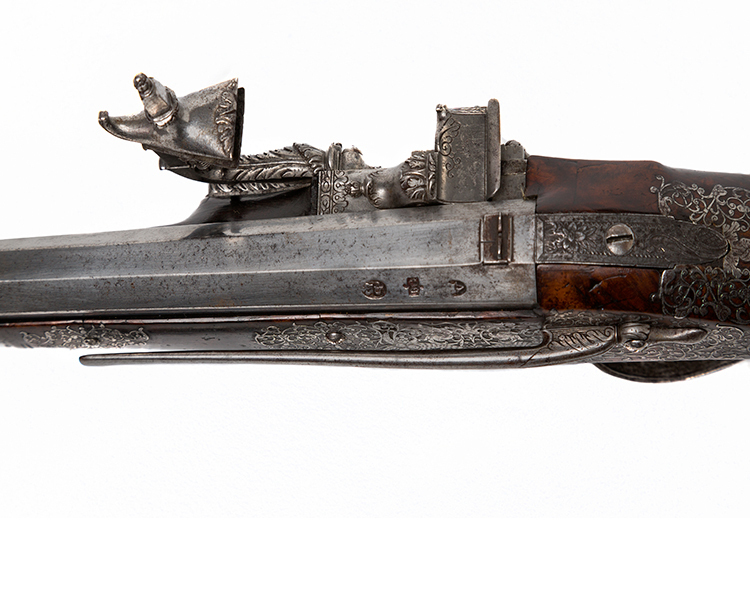 The later barrels were made expressly for these luxurious pistols in the third quarter of the 18th c. by Joseph Griffin. Perhaps the owner wished to “modernize” these antique pistols as he thought the original barrels were too fragile for contemporary use. The stocks show no signs of alteration to accommodate the English barrels. The locks (for the garniture intended as a gift for King Louis XIII of France from the Venetian Senate) compare favorably with these. See: “Art, Arms and Armour. An International Anthology”, edited by Robert Held 1979, by Marco Morin with Robert Held “And His majesty said: all my guns together are not worth one of these”. pp.252-277. Provenance: The Royal Archaeological Institute (founded 1844). Sotheby's 19 April 1963, lot 174. Clay P. Bedford, Scottsdale, Arizona. 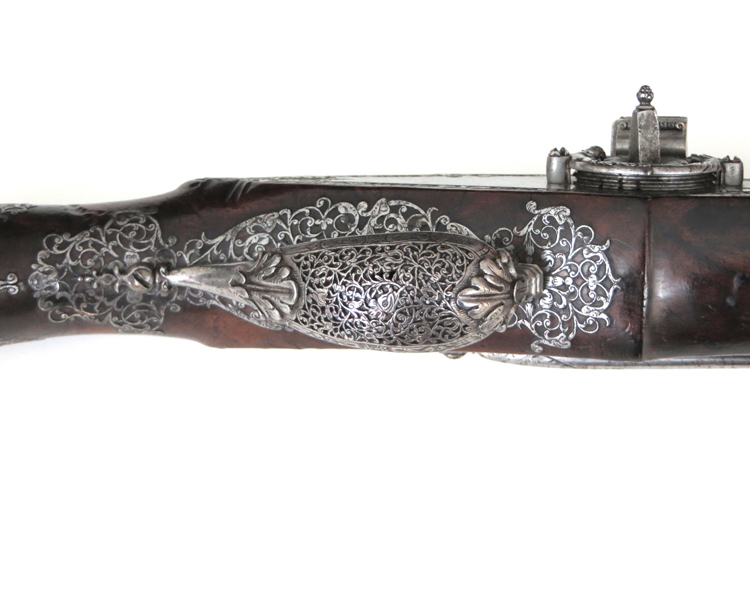 Exhibition: Williamsburg, Virginia 1977, " Decorated Firearms from the Collection of Clay P. Bedford".